It's funny, when I joined I was disappointed there wasn't a white gold option. But now I can't imagine anything but a golden key! Even if I have no jewelry to match I think it's really cool though that some orgs have the option of white or yellow gold. But there are so many songs about the girls who wear the golden key! And what about when the "six women of Monmouth College marched into the chapel service with golden keys in their hair announcing the foundation of Kappa Kappa Gamma"!! I actually wear silver jewelry, so I was a little about it too at first, but I got over it. ETA: Emeralds, diamonds and pearls are the only jewels that are allowed on our badges. This rule was put into place sometime around 1913. My badge is white gold with crown pearls and amethysts at the point. And I have a plain white gold Beta Zeta guard. I am the ONLY person in my chapter for at least 10 years to order anything other than the plain scroll border badge in silver or gold and to have a guard. The president wears a handed down yellow gold crown pearl badge during her term. The silver trend actually began as an accident in my pledge class (something with the columns and the NME messed up, but people were psyched to accidentally receive silver). Sounds kind of silly, but I wanted a blinged out badge before I went through recruitment no matter which org I joined. It is no coincidence that I happen to be the person who wears my badge the most. When I go to the house, the collegians marvel at it, not even knowing that there are badges like that. The dues include the basic badge in sterling silver or gold fill. Our chapter advisor said that the NMEs don't offer the fancy badges because they don't want to overwhelm the NMs with costs. The difference in price is about $70, and when your dues are $800ish, that's not much extra, and I'm sure some people are willing to pay it. I think if more people ordered nice badges, more people would wear them. Badges weren't included in our dues but the cost of a plain silver or gold badge were told to us up front during recruitment. It is tradition in my chapter for the big to temporarily pass down her badge to her little until her badge comes in so that she can wear a badge after initiation since she'll most likely be so excited about getting to wear it. Most girls in my chapter got the plain gold or silver, a few opted for pearls, and very few got guards. I ordered a plain silver badge as well but a couple pledge sisters ordered more blinged out badges: sapphires with pearls, emeralds with pearls, etc. There are many options for ZTA badges (pink sapphires, diamonds, turquoise of course, opal, amethyst, rubies, emeralds). You can do the stones alternating or at the points or along with the whole thing and you can also do pearl, plain, or chased guards. I don't know of many rules about the badge other than how/where to wear it I eventually got a badge on ebay (white gold with all pearls) and bought a silver guard and dangles to go with it. I'd love to find a white gold badge with emeralds and pearls since emerald is my birthday jewel. My chapter traditionally got jeweled badges. Most people had the crown pearl O, though a few had the all pearl badge (which I always thought looked gaudy!) We all coveted the ruby A badge which is an honor badge in AOII since the 1960s when they standardized what jeweled badges could be offered. We also had a lot of legacies who wore their mother's badges. A few had alternating ruby and pearl badges that were so pretty. I now have a collection of badges, including an all pearl badge that is not gaudy since it is half pearl not crown pearl. The chapter I advise at Towson only gets the plain, gold fill badge. I recently gave them a pearled badge as an honor badge, but none of their members get them for initiation. I'm not sure what my chapter sisters do currently. Last edited by AOII Angel; 10-30-2009 at 09:06 AM. I know some don't have as many options, but several orgs have what seems like a zillion different options, from plain to jeweled to enameled to white gold. And pictures please! The placement of the jewels is part of the official design. There was a time when we had an option of non-jeweled badges, but I'm glad that we discontinued that, and I like that we don't have any choice regarding the badge itself -- that all badges are the same. I like that the meaning stays consistent with what those who designed it intended. The only choice would be whether to use a guard or not. We actually get ours as part of the standard initiation fee. Us too. Guards are extra, but in my experience, most brothers get them. The chapter of Delta Chi at my school had the tradition of having the big brother pass down their badge to their little, and then they would buy a new one for themself later. Definitely a different way of doing things. Because badges for the initiates were almost never received in time for initiation, the practice in my chapter was that big brothers placed their own badges on their little brothers at initiation. The little brother would wear it until his own arrived. It just goes to simplicity. Nothing may be attached to the badge and other pins (Life Loyal, etc) need to be lower than and to the left of the badge when looking down. Our badge is also only worn over the heart (never on a collar, etc). In the early years, members had to procure their own badges, and almost all were custom-made. The only requirements were the two sets of letters on the stem and ward of the key. There are some absolutely gorgeous old custom badges! The 1924 Convention specified the “slender model, plain Roman finish, raised polished gold letters, plain background; jewelling, if wished, to be 15 pearls crowned, one on the handle and three at the top of the ward.” Six years later sapphires and/or diamonds were again optional. Just as the length and outlines of the key kept fluctuating during the first 50 years, so did the type of lettering and jewels. During World War I jewels were hard to obtain and in World War II the jewelers could not obtain sapphires. The cost of diamonds became prohibitive. Gold was on a quota basis and its content in the badge was reduced. Relatively few Kappas were affected by these difficulties since the majority of them loved the simple golden key or the pearl badge. By 1950, jewels were available for those who wanted them. My own badge is alternating sapphires/pearls. We had a range in our chapter - many girls just bought the plain gold, but I think at least one got the all-diamond one. When I advised at a different campus, hardly anyone was buying badges. So they decided to include the cost of the plain gold badge in the new member fees. If the member wants to upgrade to a jeweled badge, she can, but she is responsible for the difference in costs. in my chapter, there was no standard: we had plain badges in gold or silver, although gold jewelry was more popular in the fashion world at the time, so there were probably more gold badges. second most popular would have been gold badges with pearls, and then we had some beautiful badges with emeralds, rubies, diamonds, sapphires, opals, turquoise-some all emeralds or rubies, etc. some alternating gem and pearl and some with either all pearls and gem points or all gem with pearl points.it was pretty much carte blanche. everyone had a chapter guard. our littles wore our badges until theirs arrived. the pledge with the highest gpa got a diamond in the top tip of her badge, paid for by the chapter. in my daughters chapter most everyone ordered the plain silver badge with no chapter guard. she wore my badge until hers came in. i offered my daughter whatever she wanted, but she did not want to go against her chapters tradtion-now she wishes she had gotten a turquoise badge like mine. she did however, buck tradition by getting a chapter guard with the appropriate dangles. Last edited by FSUZeta; 10-30-2009 at 11:16 AM. I can't imagine not getting a badge! It wasn't part of the new member fees, but it wasn't an optional thing either. Most of us either got a plain badge or a chased badge- this was when only yellow gold was available. 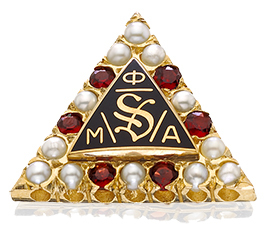 The Ruby A badge was given to the NM with the highest GPA for the quarter of initiation. It is beutiful! We didn't have the option to pass down our badges, since they were ingraved with our initials and chapter letters. We did let our littles use them until their badges came in though. We voted at the AXiD convention this summer for more badge options. Prior to now, we had plain badges with no jewels, or we could have pearls or diamonds, and a combination of. Now we have pearls, diamonds, and sapphires in light blue, dark blue, yellow and pink. There are specific combinations that are authorized though. You can choose 3 stones, or 15 stones, or you can get a vintage 20 stone pearl. The pink sapphires is only available with diamonds and pearls, but you can get light blue and dark blue together with pearls or sapphires. The yellow sapphire is only available as a part of the 3 stone badge as a a light blue, dark blue, and yellow combo. Hubby got me the 15 stone white gold, light and dark blue sapphires alternating as my birthday/christmas present this year. When I was a regional officer, I ran across a couple of chapters that didn't require a badge purchase. I suggested they add the cost of a basic badge to their initiation fees and have the officer order them all together. DG's options are plain gold, chased (with little roses molded into the badge), crown pearl, diamond, gold or white gold. Our "pledge trainer" ordered crown pearl with crown pearl guard for everybody. I didn't find out until later that there were any options! When I did, I bought a plain badge with no guard to wear with business wear. Later, my badges were stolen. When I got my replacements, I had my local jeweler add a clasp on my guard so I can remove it or add it to either badge. Gold is my color of choice, but as my hair gets more gray, I'm kinda hankering after a white gold, all diamond....! I wish we had colored gem options. Amanda, that's one bee-you-tiful badge! Lucky you! Last edited by AnchorAlumna; 10-30-2009 at 11:57 AM. Tri Delta doesn't have any options. We all get the same badge. You can get a Trident guard that has 3 options - no pearls, 1 pearl or 3 pearls or you can get a chapter guard with pearls or plain. I got a Trident with no pearls. My chapter's president's badge is beautiful though. It is slightly lager, has 3 small pearls on both sides of the Deltas in the upper points of the moon & emeralds instead of pearls in the stars. It also has a chapter guard with emeralds. I'm not sure if all the chapters have a president's badge.